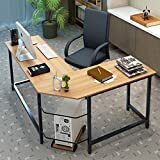 If you are looking for the best computer desk to install in your office or your room, one that makes typing and writing comfortable for you, here is a list of the top 10 best computer desks of 2019. Check them out and see which suits you perfectly. At the top of the list is the Origami RDE-01 Computer Desk designed to open and folds within seconds. It’s simple and easy to setup with 2-pary construction. It folds flat for easy storage, doesn’t need tools for setting up and no assembly needed. It comes with shelf capacity of 250 lb per shelf for level surface and 75 lb per shelf on wheels, both evenly distributed. The Best Choice Products computer desk is made out of a beautiful wood with classy, modern look. It comes with keyboard drawer and stand for computer tower as well as a study frame to support your office essentials. It includes all necessary tools as well as instruction for assembling. It is a really good quality and sturdy computer desk for all your work. Instructions could be better and clearer as a lot of people have complained about how confusing it is. 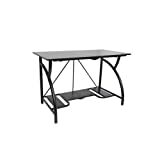 Tribesigns’ modern computer workstation comes with free CPU stand and is made with thicker steel for the frame and leg as well as E1 class environment protection desktop board. It has L-shape corner design to offer you plenty of space for computer work and writing. Super sturdy due to steel frame, excellent stability thanks to reliable mechanical design, easily assembled with all parts, tools and instructions included, super bearing capable of handling at most 450 lbs and large size for plenty of room for work. The Coaster Peek Computer Desk comes in black finish featuring a floating top as well as a keyboard drawer. Of course, the computer tray isn’t only available in black but also in brown. Coaster Peel’s computer desk also has matching CPU stand with two-drawer and casters, however, is sold separately. 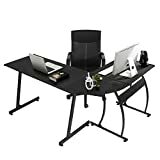 Mobile & Compact’s computer workstation desk comes complete with heavyweight MDF panels that have moisture resistant graphite finish, scratch resistant steel frame coated in powder and durable nylon wheels together with locking casters. 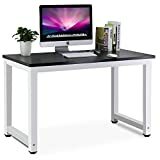 The workstation is also loved for its adjustable monitor or printer shelf (front and sides), a pull-out keyboard tray that comes with safety stop as well as CD and side media rack. If you are looking for a corner desk that comes with polished, beveled and tempered safety glass, Walker Edison Soreno 3-Piece Corner Desk is the one you’re looking for. It comes with sturdy steel frame complete with powder coat finish. It also includes a CPU stand and sliding keyboard tray and step-by-step instructions for easy assembly. GreenForest L-Shape computer workstation is made of MDF with beautiful appearance and functionally that makes it efficient for home or office use. 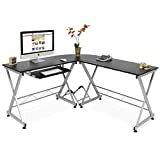 The workstation comes in 3-piece that lets you maximize space and doesn’t takes a lot of space. It comes with super sturdy frame with edgy architectural look for supporting your office materials. 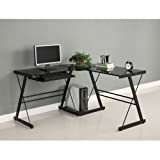 Designed for convenience, the Coaster Home Furnishings 800891 Computer Desk comes with pullout keyboard to its left side. The computer desk is designed to make setting up a home office a completely easy task to do. The desk also features a stylish cappuccino finish as well as silver accent which make it simple yet chic. Tribesigns Modern Simple Computer Workstation comes with the best features including metal legs, adjustable leg pads, wide desktop (23.6” wide), 42.9” leg distance, 0.98” thick laminated MD, heavy duty computer frame, waterproof, 1.57” x 1.57” width, 900 lbs capacity and 18 months quality assurance. It offers all the best features for a computer workstation. The Techni Mobili Computer Desk is a classy workstation that comes with storage. It features heavyweight particle board panels that are moisture-resistant and with PVC laminate veneer and wengue finish. This class computer desk is perfect with its contoured desktop shape, under table side shelf and additional 3 drawers for more storage space. The desk has flexible use for it can be a big computer workstation and also a drafting table.